This team was inspirational, so kind, and always ready to help and answer many of our questions from day one. It was great to meet the Program Director, so when I saw him walking towards us at the airport upon arrival, I felt very safe and happy. Program: We were told that school was not in session. We were so happy that the coordinator delayed the end of school by a week, for our first week, so that we could help with testing, grading, recording of the grades, and just seeing “all” of the children in their normal learning mode. The teachers needed our support since this was one of their busiest weeks in the school year. The graduation on our first Friday, was so special. The best ceremony I ever attended! I was so happy to experience and be a part of it! 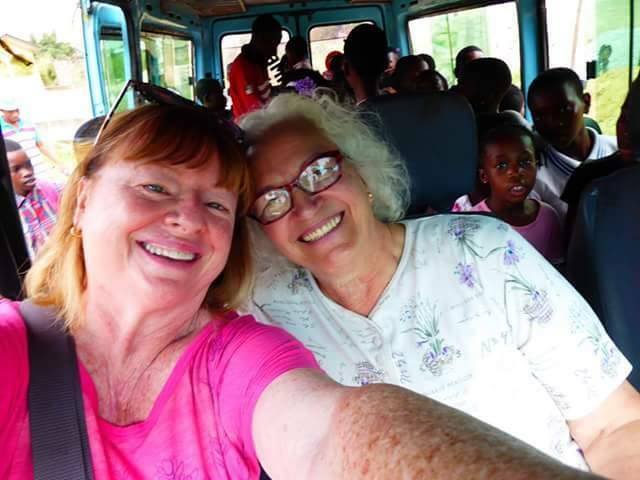 Host Family: How quick I felt and was made to feel at home in a foreign land, primary due to the love and leadership of the coordinator, Eugenia, and Oretha. So kind, helpful, fun loving, and always concerned about us as a friend. We have made long-term friends here, for life. Country: With such abject poverty, I was expecting more people around us begging for money as I experienced during two trips to India. This has been a very rare situation here in Ghana. Most people seem to be working in some form to earn or make money. People everywhere have been so eager to say hello and welcome us. Such a friendly culture that I will miss. 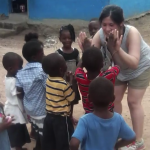 Program: Not being able to properly say farewell to all of the children. I was never clear who was living with Shadrack (30 of 100 of the children) so when graduation came, and the following Thursday which was the last day of half sessions for some of the children, I literally did not have a chance to offer one last hug – and to thank the children for their very giving love in return. I wish there was a formal process in place for such a final farewell. I hope that Shadrach passes our farewell onto each and every child! 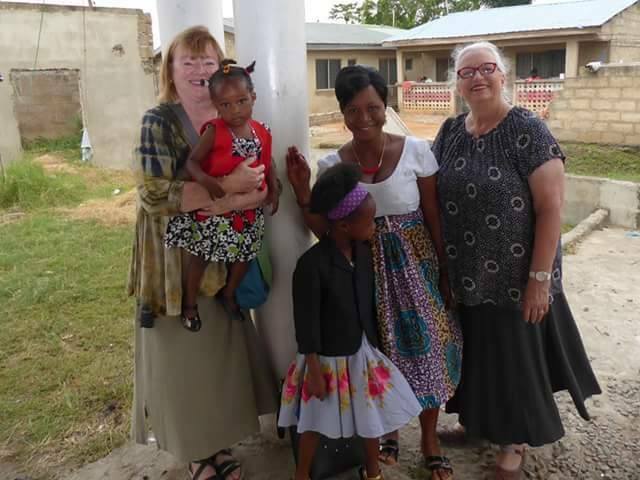 Host Family: Since learning from Shadrack that in Ghana, they are on a different time schedule and are indirect communicators, I always felt like I could have done more, e.g. : arrive to the school earlier, understand more fully how I could be helpful beyond financial support. Country: When I learned that this government not only doesn’t invest in the education of young people, but that the orphanage receives no government funding. Also, after 6th grade, the child has to pass an entrance exam for junior high school and then, he/she is responsible for paying for his/her own education, books, food, etc., until senior high school. Every child should be educated! 1- Yellow Fever inoculation was required to enter Ghana. We were not aware but it is in very short supply. It was difficult to find a healthcare organization that had a supply. 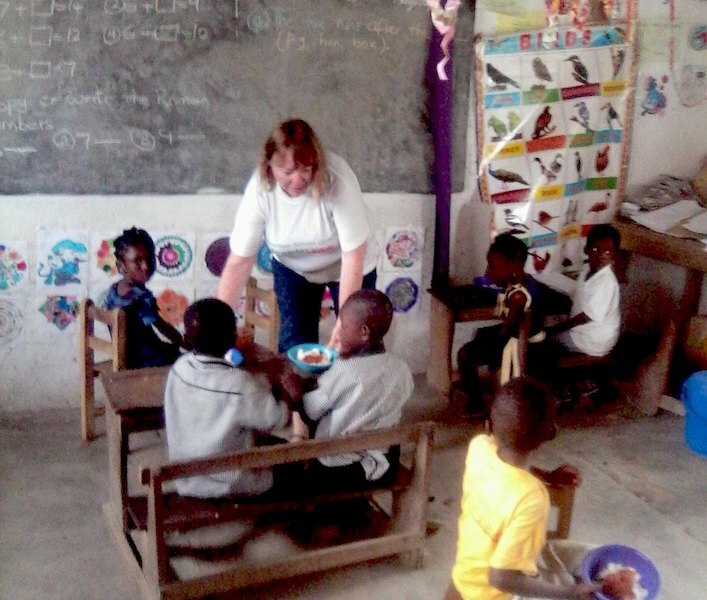 We could have lost our chance to volunteer in Ghana. The sooner that you know what you need for your volunteer experience, the better your chances will be to fulfill your desire to volunteer. 2- August weather in Ghana was humid but perfect. We learned that especially from Jan-April, it is extremely hot and dry. Wear very lightweight clothing (cotton) that covers you and be prepared to sweat. Wear sunscreen! 3- Come prepared to help in anyway needed, even with Eugenia and her girls. We provided financial help on-site in many ways because the need is great and we were able to do so. 4-Bring one nice outfit (for Sunday church) and wear comfortable shoes that are good for walking and climbing. 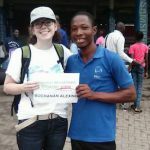 From the time when I started thinking about volunteering abroad, over a year ago, and speaking to so many people who have done this type of work, I can now say what many of them said to me – that I received so much from this experience and am so happy that I did this, especially her in Ghana. I am very thankful that I had a friend to join me, a very special experience we now have shared together. 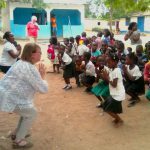 This experience, with this orphanage and with Shadrack and family, made this time one that I hope many other people try. It will be with me for life. Accommodation: The volunteer house was very spacious for Theresa and I and it allowed us to have the children here off and on. The shower and toilet did not work but we got along fine. Eugenia kept our house clean and cozy. Meals: What great memories I have of such delicious food prepared by Eugenia and Gifty (at the school). All manually prepared on coal stoves, requiring such hard work – and the food has to be purchased the same day due to no refrigeration (many memorable trips to the market in the Liberian camp and at the mall). From our breakfast, served to us every day – to our dinner, I loved it all! I will now use ginger when cooking chicken soup! Security: After a few days of getting to know the people and this area, I felt very safe. When travelling, Shadrack was very helpful and guided us on staying close to our purses and keeping our money private, etc. We appreciated him looking after us. 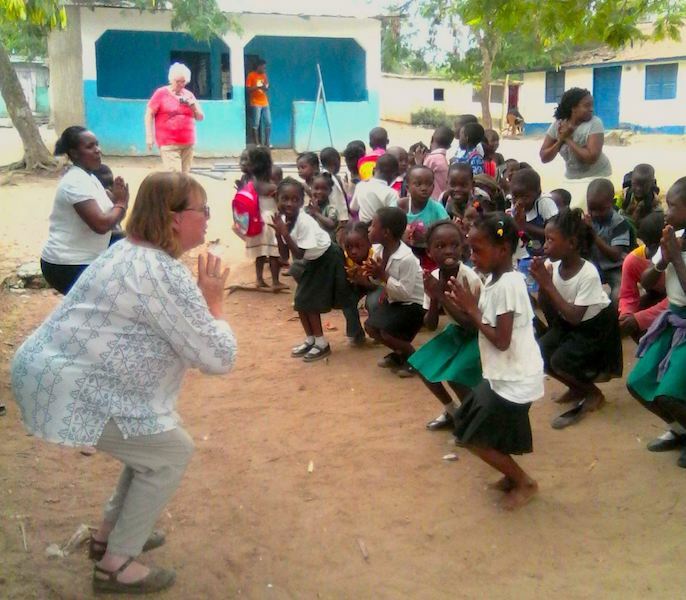 Program: The children…#1- I taught the kids stand-up yoga for their first time. They loved it and asked to do it just about every day. This was so special that I could introduce something new that they liked. Doing yoga with all of them, outside the school, and with the smaller group on the beach, was a memory I’ll always cherish. I’m leaving the list of poses behind and I hope that they continue it and pass yoga onto others. #2 Taking the kids to the beach for their first experience, even on an unusually cloudy/cool day – it was precious! I’ll never forget their joyful day! Volunteer Family/House: Besides the delicious meals and teaching us how to cook – and taking us on wonderful excursions (and church), we had so much fun with Eugenia and her daughters, Nissi and Jen, at the mall this week. We treated them to a meal out, ice cream, new clothes and shoes and many other things. We were so happy to do this and they were equally very happy. Country: It was wonderful to take two trips to visit five different different places in the Eastern Region and Cape Coast region. We also took a wonderful trip to Accra Arts & Crafts center. Such a diverse and amazing country. The driving and road conditions are like the best roller coaster ride you’ll ever have! I love that there was music everywhere you went, from morning until night! Sarah and the staff were very helpful with all of my questions and needs preparing for this journey. I appreciated their timeliness in responding electronically. I felt very positive and prepared for this trip due to ABV’s support. I did a great deal of research with many similar organizations like ABV and I felt that I made the best decision to go with them. Thank you! 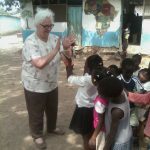 After being here at this particular orphanage in Buduburam, Ghana, I highly recommend that ABV advertise that more volunteers are very much needed here. They need much more help than they currently have had. Please let me know how I can help with this request. 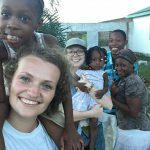 I found Abroaderview just doing online research using organizations that provide volunteering abroad opportunities. 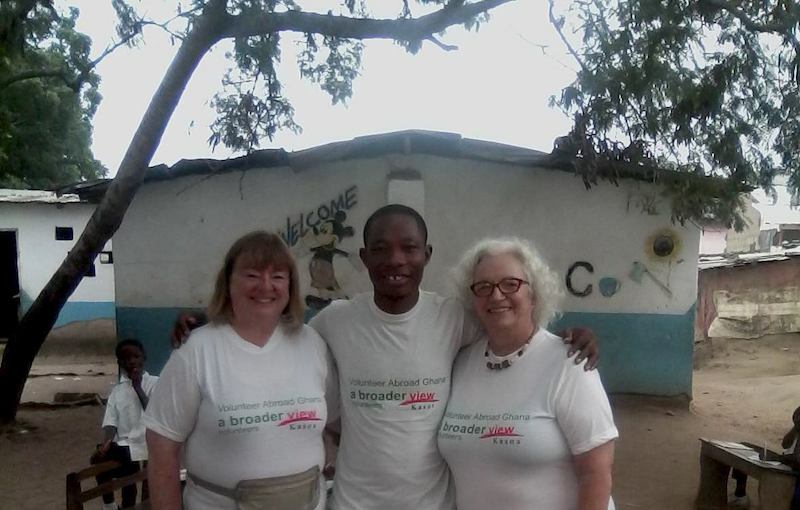 That is how I found Abroaderview and decided to volunteer with them.